You can’t beat these three Atlantic ballparks. Fly into Philadelphia to start your tour at Citizens Bank Park. From there you’ll travel to Baltimore and Washington DC for games at Orioles Park and Nationals Park. You’ll have time to check out the Liberty Bell, see the monuments– whatever you’d like to do! Guests will enjoy premium seats, great hotels, and all the Big League Tours extras. Make plans to join us. Book soon! 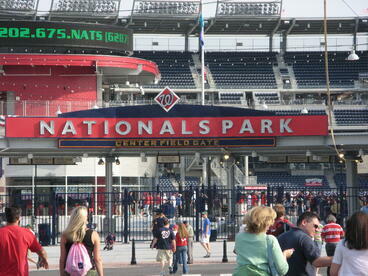 Center Field Gate at Nationals Park. "My Mom and I had an outstanding time! We appreciate how organized and first rate the experience was. From the location of the seats for the games to the hotels and transportation, the attention to detail was obvious and appreciated. Thank you all for setting up an amazing weekend for us!"